The 60's music vibe can mean many different things, from surf music and bubblegum to psychedelia and classic rock groups. The 60's was a watershed era for what might best be called "sunshine pop," uplifting melodies accompanied by bouncy orchestra arrangements, many harmonies and a happy vibe. Acts like The 5th Dimension, The Turtles, The Association, and undoubtedly, The Cowsills. 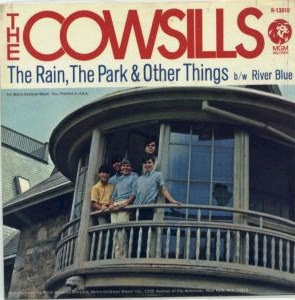 Often cited as the inspiration for the "Partridge Family" TV show, the Cowsills had two colossal hit singles, both having what may be called a "hippie vibe" for such straight all-American music and kids -- "The Rain, The Park and Other Things" and "Hair" (from the famous musical). Like The Partridge Family, the father was M.I.A. All you saw were the mother and the grinning kids, looking like total straight arrows, with cute little sis making the cool dance moves. There was something manufactured about the Cowsills. I mean, they didn't write these hit songs, and just seemed a little too cookie cutter to be true. There was also this weird Osmond family connection I always felt -- here's another group of white all-American siblings with amazing voices, except no Mormon thing happening. But in the 60's, a lot of pop music was very much manufactured by talented songwriters, producers and musicians, and it was just commonly accepted without a second thought (at least the Cowsills were really related, as opposed to The Monkees, who didn't know each other at all when they started). If I had to pick the best of the "sunshine pop" of the 60's, this song would be right on top of that list. Starting with some rainfall sound effects, "The Rain, The Park and Other Things" was very much what Brian Wilson would have called a " teenage symphony" -- lush strings, cascading harps, echoed voices ("I knew, I knew, I knew, I knew..." "Happy, happy, happy, HAPPY! "), simple electric piano chords picking up the tempo into the chorus, a beat before the second verse ("I knew I had to say hello..."), and the harps rolling down and stopping to indicate it had "stopped raining" ("Suddenly the sun broke through/I turned around and she was gone...."). A little story of meeting a "flower girl" while it rained in the park in three minutes. Seriously brilliant. I know the group eventually broke up, but young Susan Cowsill ended up singing in bands and backup on albums by roots rocker Dwight Twilley. She was also in a group with former Bangles guitarist Vicki Peterson called The Continental Drifters. Below are The Cowsills performing the song on a video lifted from VH1. Next to eating Carvel, this is one song which is completely guaranteed to make you feel great with not a care in the world, singing along like a fool ("I love the flower girl!"). The lip-synching is awful and it's kind of funny to see the two brothers playing acoustic guitars when I don't think there were any in the song. Speaking of "girls who disappeared," where was young Susan Cowsill in this video? Underneath that video is a truly special bonus -- The Cowsills singing "Monday, Monday" on Johnny Cash's TV variety show in 1969. Keeping with that totally straight image, all the males are dressed in matching blue suits and black bowties, while mom and Susan are in pink outfits with white lace. Ten-year-old Susan knew how to swing those hips with some very funky dance moves.